To be honest I had no idea what I wanted to do for the first day. I had so many partial ideas floating around in my head, but not one of them seemed to spark any excitement in me. Then while browsing Pinterest I came across an image and I knew that was going to be my inspiration. The design was simple so I knew I could pull it off, yet it made an impact on me. I don't know about you but I love it when a manicure has those qualities. I started out with a coat of Finger Paints Paper Mache and then did a gradient with Paper Mache and Sinful Colors Exotic Green. I really liked how this turned out and was tempted to stop there, but I knew that I wanted more. After all aren't challenges supposed to take you a little out of your comfort zone and push you to do designs you wouldn't normally do? After my gradient was dry I applied painters tape diagonally on my nails and used 2 coats of Sinful Colors Last Chance. I wasn't thrilled with the results. Last Chance was too dark compared with the rest of the manicure. So I freehanded 2 coats of Exotic Green over Last Chance and that seemed to pull it all together. Please ignore my pinkie nail as I smudged it right before taking the picture and didn't have time to do that nail over again. All in all, I'm pleased with how this turned out. Now let's see what the other participants came up with for the first day of this challenge. Looks great! I like that darker green you used. Man, I smudge a nail right before taking pics all the time. Drives me bonkers! I love your gradient and I like the after as well. :D Very nice job! Thanks =) I love doing gradients now that I finally got the hang of them. Thank you. I still need to work on ym free hand art but Ive gotten gradients down finally. Thanks Katherine. 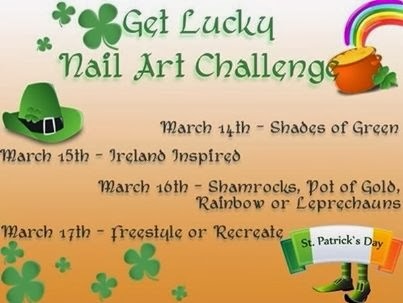 This was my favorite mani in this challenge.